I had a really excellent day today. Liam and I cruised down to Rochester for my Uncle Marvin’s surprise birthday party. We got to hang out with the family for awhile and then had to go home. We got some delicious cheese on the way home and then I got the little bugger to bed. After bed I finally got around to cleaning my actual house and doing some laundry. Seems that when you avoid those things, they don’t just go away. Hrrrmm. Well, I might as well go to the garage anyways. Can’t hurt. I glanced at the dodge and found that the driver door window was starting to crack in another place from opening and closing the door so often. Sad. 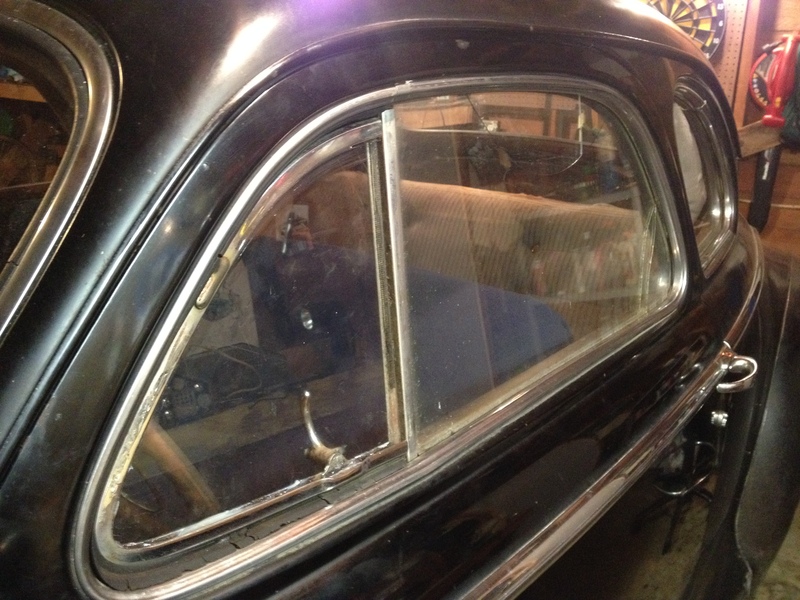 Most of the glass needs replacing anyways, but anything not vital is best saved for later. I then realized that it is getting cold out, and I still don’t have a driver vent window(as you may recall, it flew off in transit, shattering into pieces on the highway. So I started to clear out the what I assume was once rubber around the window frame and prep it for a temporary plexi replacement. This is when two of my friends Zach and Jenny phoned me up and wanted to know if I wanted company. Sure! So neither of them have seen the car yet, so I better give them the tour. Here’s this, here’s that… go ahead and sit down. Now my friend Zach is an electrician, so I just assume he is good luck. He opened the passenger door and the dome light switch kicked on the dash light for the first time ever. What?!!? I thought this was insane, him just being near the car has caused another piece to operate correctly. I tell him that there is a dome light in the rear, and it has a good light, but the switch does nothing. I show him by wiggling the switch…. Never mind…. that light works just fine. I guess the switch just needed to be put into the non existent middle position. Zach, you are a magician. Now all that is left is the spot light. Anyways, I went back to my plexiglass after showing them the rest of the car and giving it one good late night start. Still sounds great with the exhaust patched up. We ended up doing a pretty decent job of cutting up some plexi and fitting it into the window frame and then siliconed it into place. Certainly not show car quality, but should keep some wind out of my face. 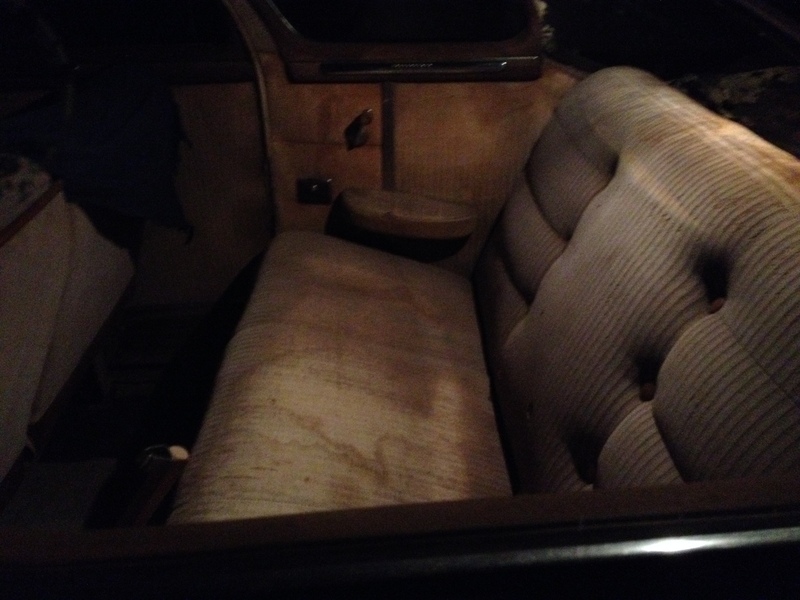 6 volts of powerful light illuminating the yet to be fully cleaned cloth interior. Plexiglass vent window in place, hard to see, but on the top of the other door window is a newly formed group of cracks. Well, I thought I’d finish things off by doing an a/b comparison of the blog’s cover photo versus one I took tonight. It’s not as dramatic as a change as I would have liked, but I blame the flash on my photo. I’m still trying to figure out how Apple’s Photostream feature on my Windows computer stopped working. This has caused me to stumble with new posts. I mean, its not like uploading photos is more difficult than it was. 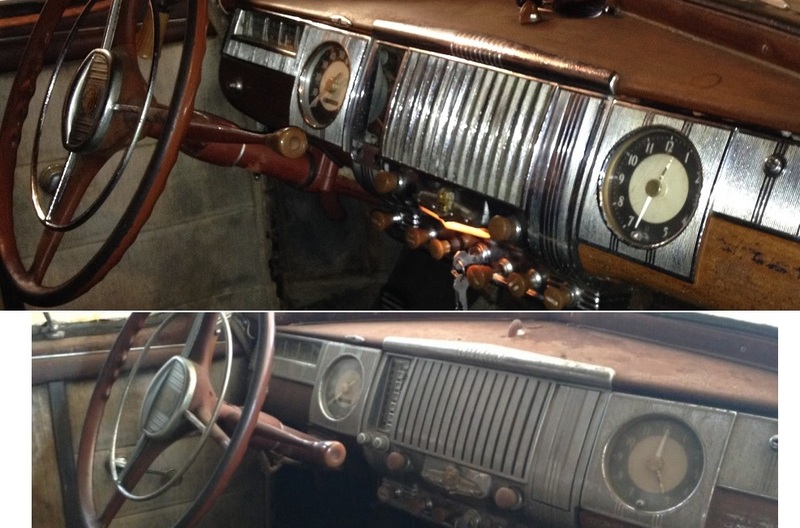 I just have to use an old fashioned cord now, instead of radio waves. Anywho. The visit from Myrna and Donald yesterday got me motivated again, despite an annoying and lingering cold. 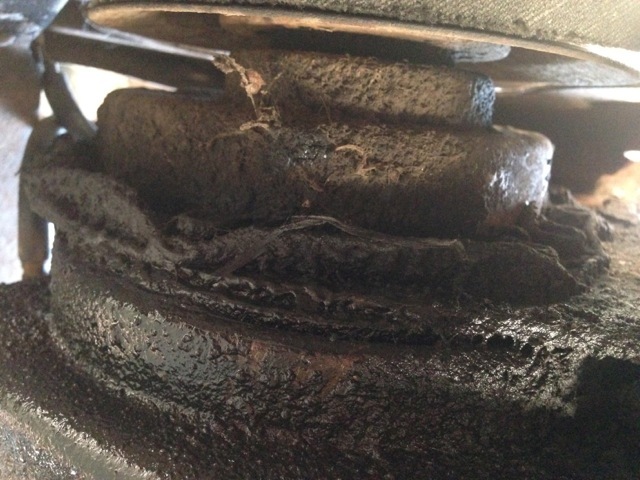 We tried a new fan belt, nope, wrong size. 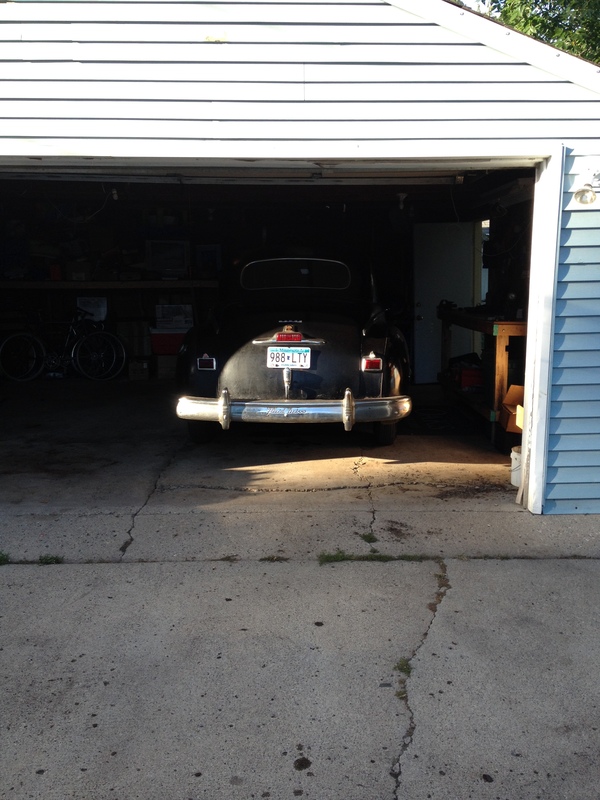 We bought some flex pipe for the exhaust, nope my hack saw wasn’t going to cut it(pun intended). Seems the only real accomplishment was the oil change yesterday. That’s ok. It was a great day indeed. 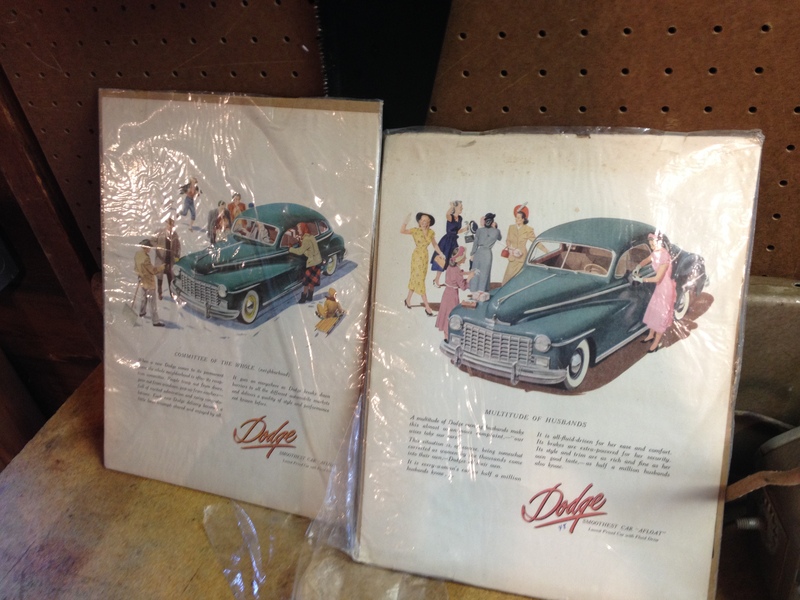 I forgot to mention Donald brought over some really old magazine ads for 1948 Dodge coupes. These were gifts from our friend Tim Asleson. They’re so awesome. He found one for me and one for Myrna. Along with a half dozen Jeep ones for Don. Reminds me of the first time I found an old advertisement for my 1980 Celica. So fun to see how companies advertise their products. Don also had tucked away at his home a large box of valve rings and main bearings for the 1947. These will be very important if and when a rebuild is required. But that will definitely be saved for another day. Friday was another day spent recuperating from a cold and not really trying to overwork myself. But something had to be done. I acquired a reciprocating saw which used the same battery pack as my weed whip(hey if its good enough to whip my weeds into shape, it must be good enough to cut sheet metal.) 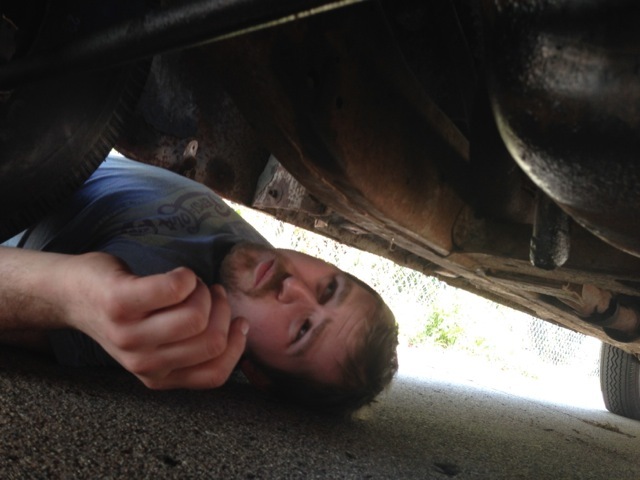 I then tackled the exhaust leak. 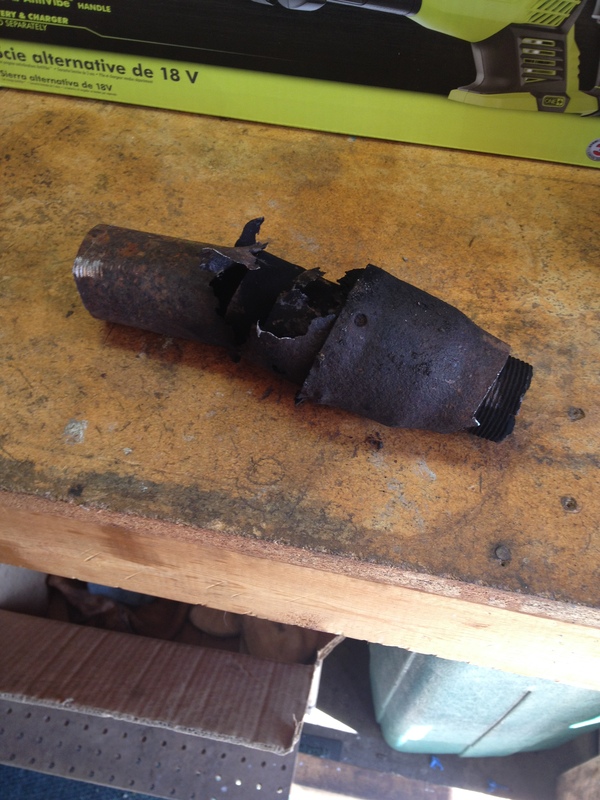 Two or more pieces of exhaust pipe combined with a standard water pipe. 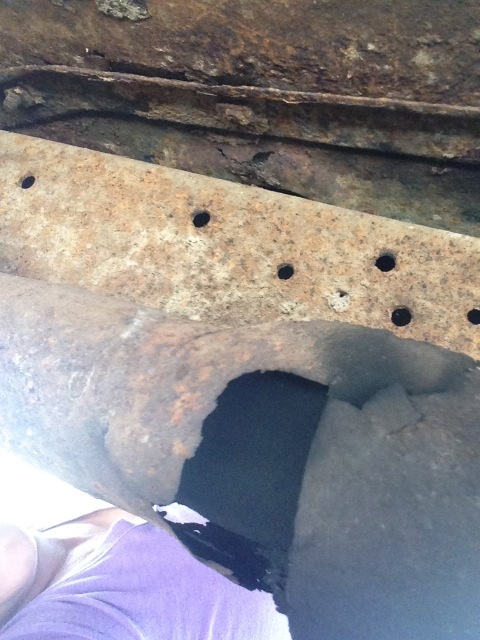 I tore through the old pipe and finally this giant hole combined with pipe fell from the car. 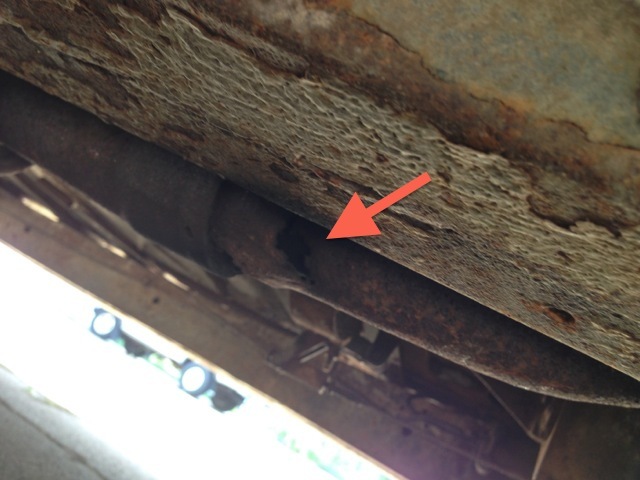 It appears that the exhaust in this car consists of a muffler from … something, a piece of standard home metal pipe, coat hangers and a lot of luck. The luck has been keeping everything together for all these years, but mixed in with all that luck were a lot of fumes. Mostly entering through the gaping holes in the floor boards and going straight into the noses of the passengers of the car. And being the mechanic that I am not, I just cleaned out a path and attached a nice foot long portion of flex pipe between my two cuts and clamped them in place. I finished off the task by dabbing the muffler with some muffler sealer and wiped my hands clean of this situation for the time being. A brief starting of the car was rewarding as suddenly the car roared like a lion, instead of the previous sound of a herd of cattle being chased by a P-51 Mustang. Artist Representation – no bovine harmed during the creation of this image. Well, I did my work thing tonight and when I got home I had to do something else. So I decided to try my hand at upholstery cleaning. 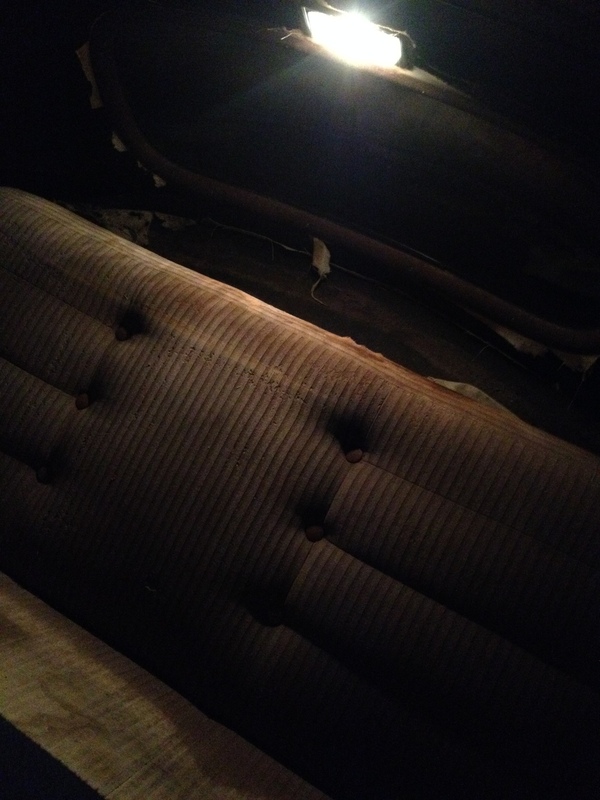 The upholstery that remains is original and in different levels of light actually looks pretty awesome. Aside from the rips and the sun fading some of it is quite salvageable. At least for patterns and ideas. 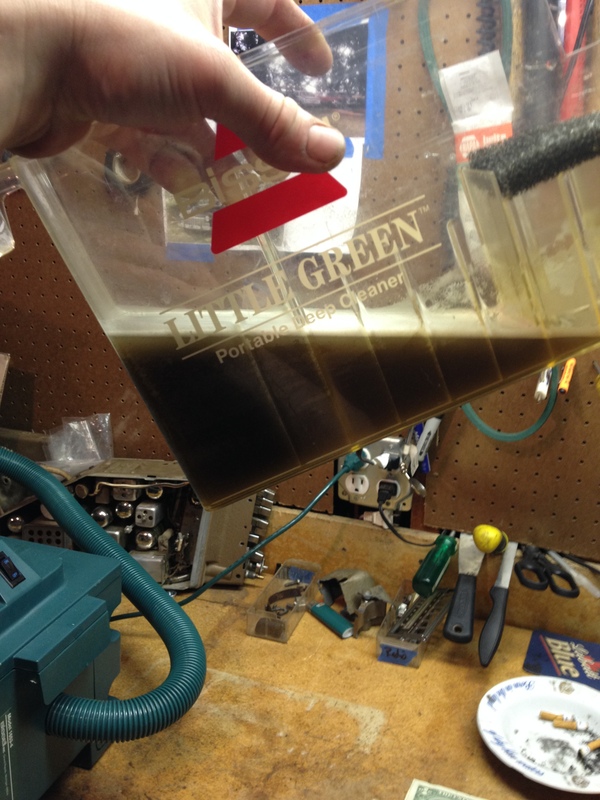 I used a mixture of hot water and patience and ended up with a waste container that was pleasantly dirty as dirt. Well, time to call it a night. I’ve mentioned before that the Dodge lives in Joel’s garage instead of at my house. This is the perfect arrangement because Joel is the main person working on the Dodge plus he lives near our big brother, Don, who is a mechanic and stops by often to help out. Still, it’s kind of a bummer that I live 30 some miles away because I don’t get to work on the Dodge that often. But I don’t end up feeling that left out because Joel sends me text message updates on his progress several times a week. “From mom and dad?” I texted back. 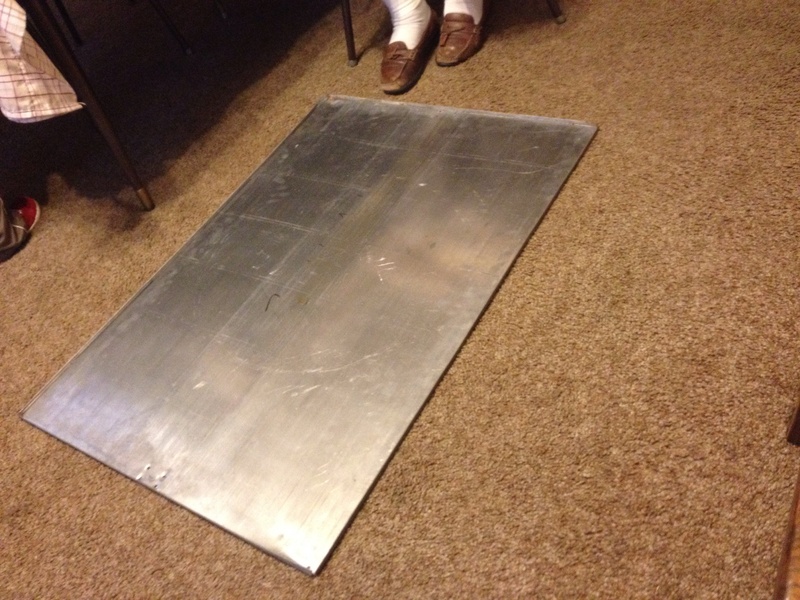 I figured the nice piece of sheet metal came from our parents – in part because I recognized our Mom’s shoes in the picture and our parent’s family room carpet but also because Dad knew that we desperately need some sheet metal to patch the Dodge’s rusted through floorboards. And Dad pretty much has one of everything in his garage so it only made sense that Dad would have found some sheet metal to send home with Joel. Dad is nice like that. “Yep,” was Joel’s reply. What a great gift! And Dad sent Joel home not just with one shiny piece of sheet metal but two! I found it interesting that Dad happened to give Joel sheet metal that day because the night before I dreamed that one of us found some sheet metal. In my dream the sheet metal fit in the front of the car perfectly with no cutting or bending required (Hmmm, interesting. 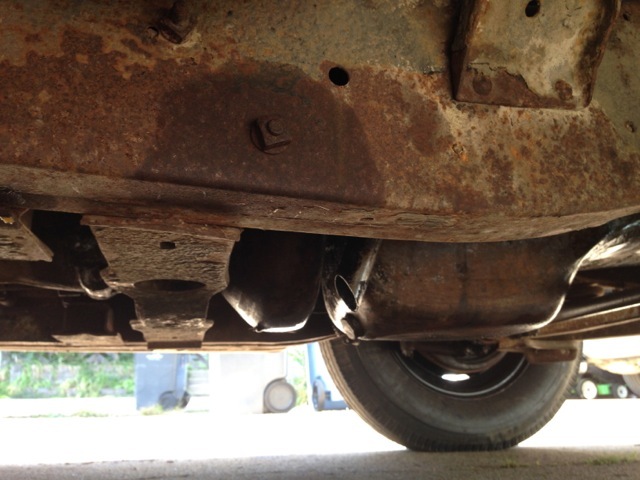 I’m having Dodge related dreams now) and we were able to patch the rusted floor. Well, these pieces of sheet metal are flat and it’s going to take some doing, and the proper tools which Joel does not have, to get the metal cut and shaped to fit. We’re a ways away from actually having a patched floor so that we can drive the Dodge and not see the street through the holes. 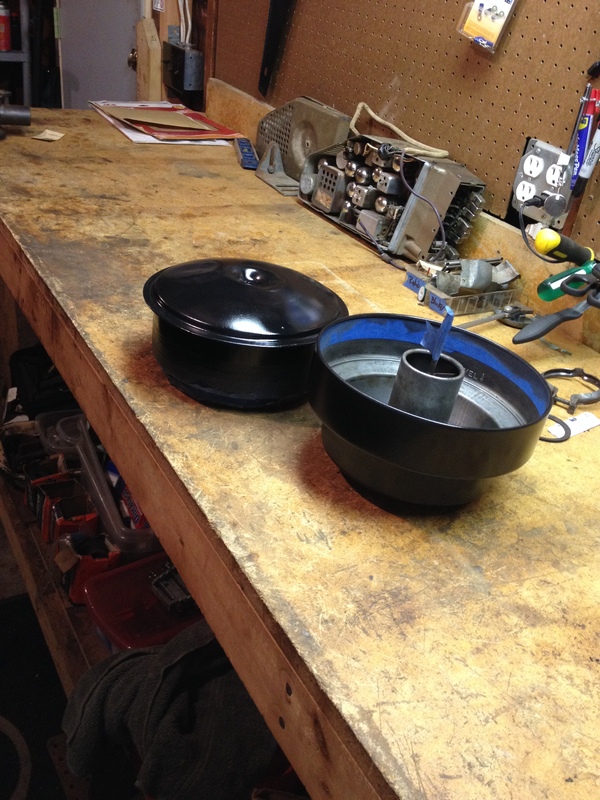 But having the sheet metal for the project is more than a good start.